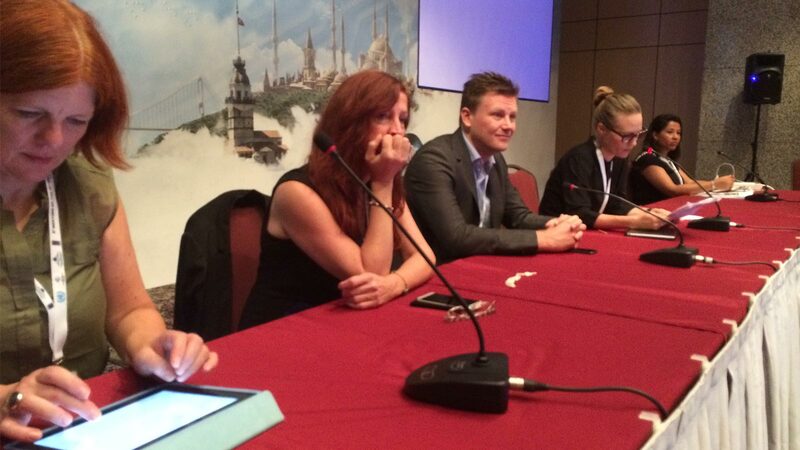 9 Sep, 2014 Last week, I was in Istanbul for the UN-organised Internet Governance Forum (IGF) where I was part of a panel on Privacy as Innovation. In this initial article, I want to introduce my thoughts on the subject. It’s very hard to talk about privacy today because, thanks to the efforts of corporations like Google and Facebook, we are beginning to lose the original meaning of the word. You see, privacy used to mean ‘for you alone’. To have privacy is to control what you want to keep to yourself and what you want to share with others. When Google and Facebook talk about something being private, however, they have a different definition. When Google or Facebook talk about privacy, they mean ‘just between us’: just between you and Google; just between you and Facebook. So when Google and Facebook say ‘private’, what they really mean is ‘public’. In his novel 1984, George Orwell had a word for this. He called it ‘doublethink’. In order to understand what a privacy setting is on Facebook or Google, we must necessarily engage in doublethink. Because when you set something to ‘private’ on one of these spyware platforms, you are actually setting to be publicly shared with Facebook or Google. Uncle Google and Uncle Facebook get to see everything, always. That bit of the agreement is never up for discussion. When you use a Google or Facebook product, you are in their home not yours. They get to watch, analyze, and exploit everything about you. This is not a bug, it’s a feature. It is simply their business model. And this business model — spyware — is the dominant business model on the Internet today. So, if we are to have a meaningful conversation about privacy, we have to remove this doublethink and reframe the conversation. Instead of focussing on how we can best protect your privacy and rights when we’ve left you to live in the home of an uncle who must invade your privacy to pay the rent, how about we start you off in your own home instead? There is nothing infeasible about this model — it simply is not the model that is currently being disseminated by Silicon Valley. In this model, which I call Independent Technology, the default is to start with technology that you own and control. The default is private. You own your own home and no one has a defacto right to spy on you. Then, you can decide what you want to share with others and what you want to keep private. The original (and only legitimate) meaning of private: ‘for you alone’. In the ind.ie model, there is no creepy uncle in the middle who wants to know everything you do and say and where you are and who your friends are. The business model of Google and Facebook is the business model of spyware. And it is just one possible business model for technology. It happens to be a business model that erodes our human rights and fundamental freedoms and it just happens to be a business model that is toxic for the future of democracy. What Google and Facebook want you to believe, however, is that it is the only possible business model. That if you’re against this myopic and toxic business model — that if you’re against their spying — that you are against innovation, and job creation, and all those cornerstones of traditional conservative rhetoric. Of course, nothing could be further from the truth. What we’re against isn’t innovation — quite the opposite — we are against the monopoly of one myopic and toxic business model that treats people like raw materials to be mined; like livestock to be farmed. In reality, it is exactly this business model that stifles true innovation. Innovation that would benefit individuals and humanity, not just corporate interests. Innovation that would strengthen freedoms and democracy, not erode it. This is the kind of innovation we should be supporting. And this is the kind of innovation that independent technologies will provide. The sooner we realise that Google and Facebook (and their Silicon Valley ilk) are malware, the sooner we can attempt to halt their efforts to digitally colonise and infect Europe with their viral business model. Make no mistake: the name of the game is digital colonialism, the war chest is venture capital, and the infantry are startups. The sooner we wake up to this, the sooner we stop welcoming the imperialists from Silicon Valley with open arms, the sooner we start supporting independent technology initiatives, the sooner we can start to build an alternative future. A future where individuals, not corporations hold power. A future where human rights and democracy are cornerstones. The future that humanity deserves.